The elite funds run by legendary investors such as Dan Loeb and David Tepper make hundreds of millions of dollars for themselves and their investors by spending enormous resources doing research on small cap stocks that big investment banks don’t follow. Because of their pay structures, they have strong incentive to do the research necessary to beat the market. That’s why we pay close attention to what they think in small cap stocks. In this article, we take a closer look at Pfizer Inc. (NYSE:PFE) from the perspective of those elite funds. Hedge fund ownership of Pfizer Inc. (NYSE:PFE) declined for the second straight quarter, having fallen by 34% during that time. 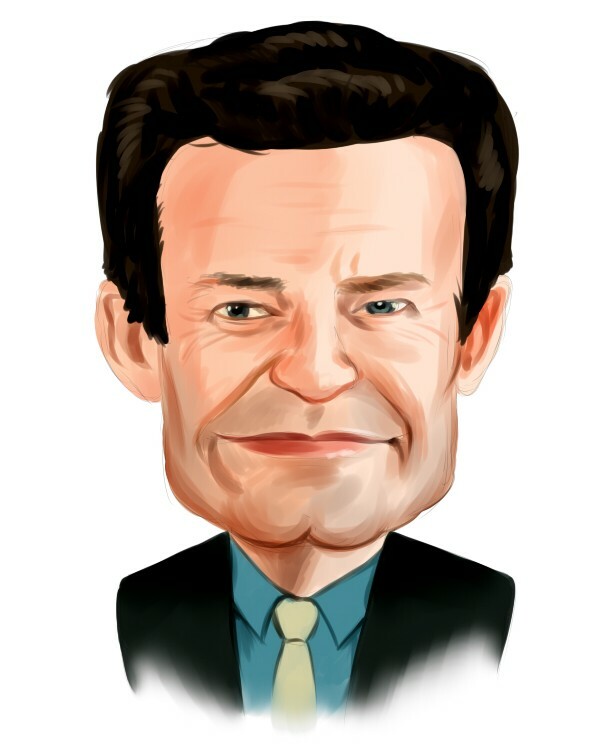 Fisher Investments was not among the funds selling off Pfizer, as the stock ranked 6th among Billionaire Ken Fisher’s Top Stock Picks Heading Into 2019 An enthusiastic dividend investor, Fisher has surely been pleased with Pfizer’s 3%+ dividend yield over the past 12 years. Today there are a large number of gauges stock market investors use to value publicly traded companies. A pair of the best gauges are hedge fund and insider trading interest. Our experts have shown that, historically, those who follow the best picks of the elite fund managers can outperform the market by a significant margin (see the details here). At the end of the third quarter, a total of 48 of the hedge funds tracked by Insider Monkey held long positions in this stock, a 6% drop from the previous quarter. 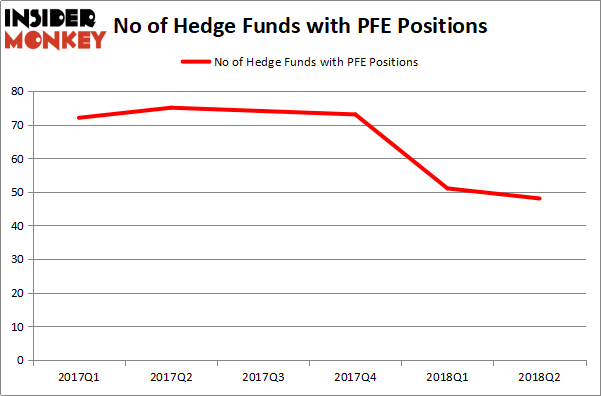 The graph below displays the number of hedge funds with bullish positions in PFE over the last 6 quarters. So, let’s see which hedge funds were among the top holders of the stock and which hedge funds were making big moves. More specifically, Ken Fisher’s Fisher Asset Management was the largest shareholder of Pfizer Inc. (NYSE:PFE), with a stake worth $1.43.1 billion reported as of the end of June. Trailing Fisher Asset Management was AQR Capital Management, which amassed a stake valued at $525.8 million. Dorset Management, Levin Capital Strategies, and Beddow Capital Management were also very fond of the stock, giving the stock large weights in their portfolios. Seeing as Pfizer Inc. (NYSE:PFE) has faced declining sentiment from the entirety of the hedge funds we track, it’s easy to see that there exists a select few money managers who sold off their full holdings last quarter. It’s worth mentioning that Matthew Hulsizer’s PEAK6 Capital Management dumped the largest investment of all the hedgies followed by Insider Monkey, valued at close to $13.9 million in stock. Solomon Kumin’s fund, Folger Hill Asset Management, also cut its stock, about $8.9 million worth. These bearish behaviors are important to note, as total hedge fund interest dropped by 3 funds last quarter. Let’s go over hedge fund activity in other stocks similar to Pfizer Inc. (NYSE:PFE). These stocks are Verizon Communications Inc. (NYSE:VZ), Cisco Systems, Inc. (NASDAQ:CSCO), The Procter & Gamble Company (NYSE:PG), and The Boeing Company (NYSE:BA). This group of stocks’ market values are closest to PFE’s market value. As you can see these stocks had an average of 49 hedge funds with bullish positions and the average amount invested in these stocks was $3.71 billion. That figure was $3.57 billion in PFE’s case. The Boeing Company (NYSE:BA) is the most popular stock in this table. On the other hand The Procter & Gamble Company (NYSE:PG) is the least popular one with only 44 bullish hedge fund positions. Pfizer Inc. (NYSE:PFE) is not the least popular stock in this group but hedge fund interest is still below average and falling rapidly. This is a slightly negative signal and we’d rather spend our time researching stocks that hedge funds are piling on. In this regard BA might be a better candidate to consider a long position.